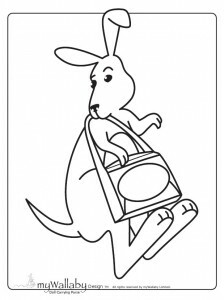 Our friends at MyWallaby – a company that has designed the cutest doll carrying purse for little girls, have sent us this coloring page of their mascot kangaroo to share with our readers. Click on the image above to view and print the kangaroo coloring page full size. Visit the MyWallaby site for more information on this cute gift idea for little girls who love to take their dolls with them everywhere.